In German-speaking Alpine lands, as Americans are increasingly aware, St. Nicholas is accompanied on his gift-giving rounds by the devilish Krampus, who’s said to punish naughty children with stinging blows from birch switches, by stuffing them in a sack and carrying them off to hell, throwing them in a lake, or even eating them -- punishments that all seem infinitely more pleasant than sitting through Michael Dougherty’s horror-comedy Krampus due in theaters December 4. I am not a film critic. I was invited to a preview screening because of my involvement in co-producing Krampus events in Los Angeles since 2013. Over the course of these events and in writing a book on the subject, I’ve had conversations with dozens of Europeans who don the suits annually. I’ve talked to mask-carvers, and Austrian cultural anthropologists, and gotten close enough to Alpine Krampuses to smell their animal pelts and steamy, schnappsy breath. I know the Krampus pretty well, well enough to say this film has almost nothing to do with that old devil. Even from the trailers I already knew we weren’t exploring authentic traditions. I expected some creativity with the tradition and wanted to be entertained. I was there as a horror fan. I’ve been one all my life. By the age 10, I could tell you the release date, directors, lead players and usually the make-up artist behind any of Universal’s classic horror films. But sitting in the Carl Laemmle building watching this, I could hear the old man cursing the very first pfennig he dropped in a nickelodeon. Though I wasn’t there to fact-check, ticking off plot points against those of the accepted mythology did help pass the time. Opening with a title sequence stalely parodying holiday commercialism, the film spends some time angling for comedy at the expense of lower class relatives (David Koechner, Allison Tolman and offspring) arriving at the home of the upwardly mobile family parented by Adam Scott and Toni Collette. As the holiday snark and bickering plays out, the film’s young protagonist Max (Emjay Anthony) and his German-speaking grandmother (Krista Stadler) share inklings that something more profound is afoot. During a dinnertime spat, Max rips up his good-hearted letter to Santa, and before you know it, apocalyptic clouds roil over the neighborhood, a blizzard erupts, and the power goes out, leaving the family isolated in a sort of Night of the Living Dead “something’s out there” predicament. Once Grandma spills her old-country secrets regarding a childhood encounter with the Krampus, people start dying, a monstrous horned thing is glimpsed, and killer Christmas toys aided by assassin gingerbread men begin bedeviling the families. All this provides endless and unsatisfying build-up to the unsatisfying reveal of the Krampus himself. The thing concludes with a double-twist ending partially borrowed from of A Christmas Carol. Seriously. Pretty much the only touch-points this thing has with the tradition are the creature’s horns and the fact that he showed up in December. Not even on the right day though. The traditional Krampus comes on December 5, eve of St. Nicholas Day, not Christmas as in the folklore laid out by Dougherty’s wise old German Grandma. With St. Nicholas completely extracted from the formula this would, of course, make no sense. Also extracted were the Krampus’ fellows. Krampus is a herd animal. He traditionally appears not alone, but usually in groups of three or more accompanying the saint and totally under his control. He is the saint’s slavish helper, not the sort of freewheeling Antichrist of Christmas Doom portrayed in the film. Not only was Krampus’ role in punishing naughty children pruned away, but the iconic sack for young miscreants was transformed (in compliance with the misleading Krampus-as-evil-Santa meme) into a sack of diabolical killer toys. There are no killer toys. No gingerbread men. Do I have to really say that? The very American Krampus-as-evil-Santa errors are pervasive. He defies all spatial logic to squeeze down a chimney. He has a sleigh pulled by musk-ox-like reindeer. He is assisted by elves, who ironically look more like the Krampus than the character himself as some appear to be outfitted with genuine Krampus masks (while other confusingly wear Venetian carnival masks.) And the monster’s character design seals the deal, visualizing the Krampus as an oversized humpbacked being in a fur-trimmed robe, white-bearded, and with ghoulish but human face resembling a rather exhausted Santa Claus. Aside from the horns, the only other commonality with the European devils are the monster’s bells and goat hooves. But, unlike the Austrian or German Krampuses, who make their presence known long in advance by the ungodly clamor of oversized custom cowbells fixed to special bell-belts, Dougherty’s beast wears only a few small, mostly invisible, and completely inaudible bells of the wrong type (oversized American jingle bells vs. the custom cowbell-style bells, or “frog-mouth” bells as they’re called in German, for you sticklers.) Even the goat hooves he sports are never really a feature of the traditional Krampus costume. Transforming human legs and feet into those of a goat is the domain of Hollywood FX shops, and was never a goal of rural Alpine peasants who dreamed up the beast. Even if hooves had been desired, they would never have been seen in the deep Alpine snow the devil treads. The goat-footed creature is actually a rather distinct late-coming breed dreamed up by graphic designers in more urban settings. It was strictly a feature of the Krampus postcards popular in the 19th- and early 20th-century, and now, in American Internet memes. But this is a matter of trivia. 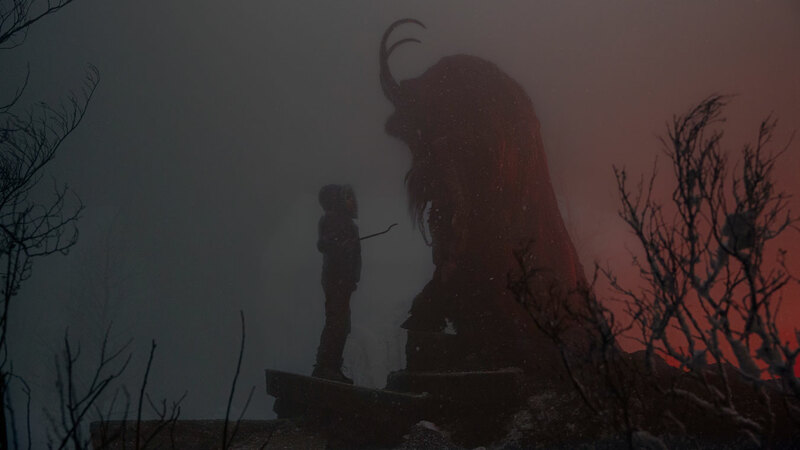 The point is, Krampus trashes the perfectly good horror potential of traditional mythology in a film that is neither funny, nor scary. If you want a good Christmas horror film, please watch 1980’s Christmas Evil. And if you want a good Krampus, have a look at the thousands of delightful YouTube videos of Austrian or German Krampus runs and their astounding hand-crafted costumes. If you can ever afford a trip to see this in person, you won’t regret it, and if you can’t, we’re bringing the first Austrian troupe to visit the US to LA December 10. More troupes are due in LA in 2016, and I would not be surprised if more cities begin extending this invitation as the years go by. I just hope the Europeans will still be willing to come after seeing this film. Al Ridenour, along with founder Al Guerrero, produces the LA Krampusfest and is the author of the forthcoming The Krampus and the Old Dark Christmas available from Feral House in autumn 2016.